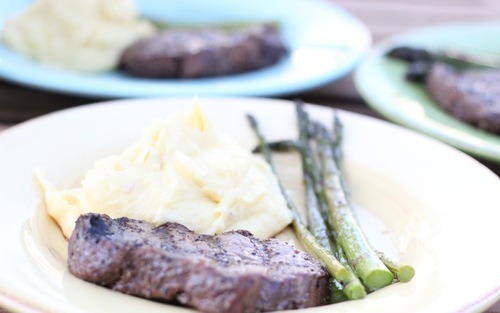 One of my husbands favorite meals is a good steak, asparagus and potatoes! Surprise, surprise! I think that’s probably most guys’ favorite meal! It never fails to satisfy. Here’s how it goes at our house! Let the potatoes boil to get tender for about 15-20 min. Drain water off potatoes, add the following and mix until smooth. (Do not over mix! Potatoes that are over beaten get glossy and the texture gets gummy. I use tenderloin because that’s what my Dad uses and he is the Grill King. But pick your favorite steak. The same rules apply. Onto an already hot grill between medium and high heat. 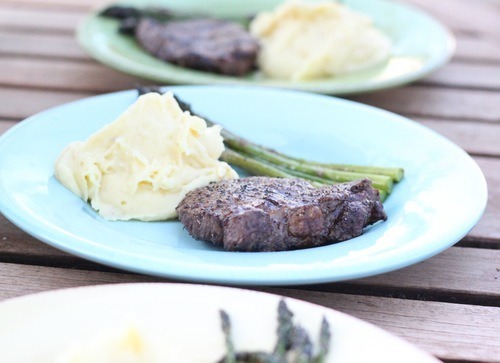 Depending on how thick the steak is and how well you like your steak cooked will determine grill time. My husband prefers medium-well, meaning slight pink. So I let the steak go for about 4 min a side. Then take the steaks off the heat and let them rest a few minutes before serving. Rinse and cut a little off the thick ends. Lay flat on tinfoil, brush with olive oil and sprinkle with kosher salt and pepper. Fold sides of tinfoil up around asparagus so no heat can escape. found your blog through Q and A design. you have some yummy looking recipes! Thank You! We are in the process of getting all our recipes and posts copied over from tumblr, so there should be a lot more comin'. ummm.... canned milk? what is that, where do you buy it? cause i want to make those potatoes! oh good i saw that.... i was worried it was some crazy powdered milk when i went shopping last night, that was 7.99 for the small box. I will be making these potatoes, the beef stock mushrooms and some pork chops for dinner this weekend. One question do you have a easy way to print out your recipes? I made the lemon cookies and rolled them in pink sanding sugar! Super cute, even if they looked like easter eggs! Hi! Ya luckily it's not the 7.99 stuff! ;) We are actually working on getting our recipes printable ASAP! It makes it soooo much easier I know! And hello!!! Loving the idea of rolling the lemon dough in pink sanding sugar! So cute! I may just have to go and get me some of that! when people left my house i took the rest of the mashed potatoes (in the huge bowl)to my sofa.. added extra butter and ate them watching tv while my husband walked the dog. we then got into a huge fight cause i ate the rest of the potatoes. i have to make them again soon. oh and whoops i bought the cream of chicken with herbs campbells soup and they were still super yummy! i told everyone here in jersy about you site... I just love it!